The collision had torn a huge hole in the rear of the fuselage. The left horizontal stabilizer was gone. Shivering from the impact, the badly damaged tail section looked like it could go at any moment. At the last moment, the fighter turned to pull away. Suddenly, the pilot froze – one of the American gunners had found their mark. The fighter shot right over the cockpit of the B-17 All American with a deafening “whoosh” before plowing into the tail section. The craft shuddered as a tremendous “whoomp!” tore through it. A quick head count of the stunned crew revealed that, amazingly, nobody had been hurt. Realizing they may only have moments left before their bird fell apart, they leaped into action. They grabbed their parachutes and prepared to bail. Aware that every mile counted, the pilot kept them on course. They were flying above the Sahara dessert. Inhospitable at the best of times, the territory was bitterly contested. 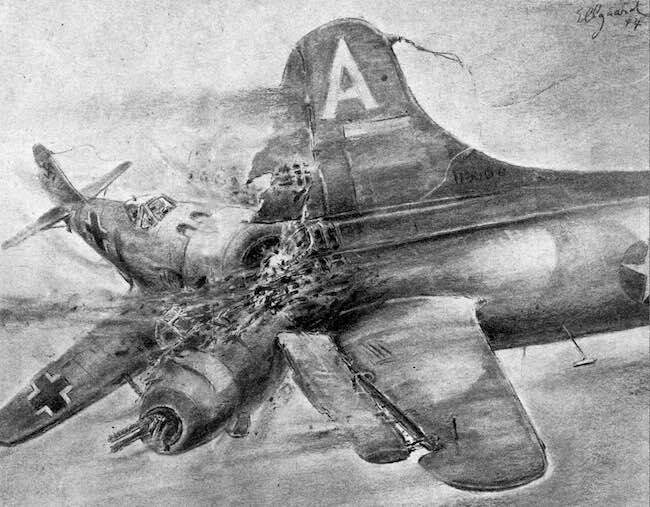 Nobody expected the B-17 All American to hold together long enough to reach the base in Algeria. The rest of the bomber formation moved closer to the crippled craft. Their overlapping lines of fire would stop any other fighters from getting too close. And the American fighters flew closer to the All American. The mission had begun well. Despite heavy opposition, the formation had made it through waves of fighters and flak to reach their target. The All American had performed its bombing run without incident. As they turned to return to base, a pair of Messerschmitts had attempted to intercept them. But the gunners had kept them at bay, and the fighters had turned back. Much later, the formation ran into 2 more Messerschmitts. The first sign of them was when they were spotted climbing towards the bombers from 2 miles away. This time, the German fighters pressed the attack. The German planes split up. One of them attacked the formation leader. The other dived straight at the All American. With gunners from both bombers targeting them, both of the German planes were destroyed. The fighter attacking the lead bomber plunged from the sky trailing a plume of black smoke behind it. The second collided with the All American. In a sense, the men on the B-17 All American were incredibly lucky. 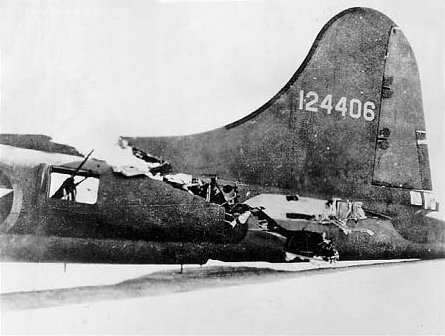 The Messerschmitts came within inches of hitting the cockpit. Instead, the bomber was still relatively intact and able to fly. In fact, it managed to make it all the way back to the base. Of course, it had to limp back home. As soon as they were out of enemy range, the other planes in the formation sped ahead. To the men on the wounded craft, the journey seemed to take a decade. Every little lurch and vibration threatened to shake the tail loose. But it managed to hold itself together, thanks to the rugged design of the B-17 and the delicate flying of the pilot, Kenny Bragg. They managed to make it back to the airfield and landed safely, although not elegantly. The tail wheel wasn’t working, which was hardly surprising. So they had to skid the last 100 yards. An ambulance had appeared, expecting to meet with scenes of horrible carnage. But it wasn’t needed. None of the crew were injured, and they were all able to walk away without assistance. It was a stunning story and was living proof of the capabilities of the craft and the men who crewed her. And it was well documented, too. Photographs taken in the air and on the ground show the extent of the damage. Without photographic evidence, most experts would doubt the truth. It just flies in the teeth of common sense to believe a B-17 could fly under these conditions. The adventures of the B-17 All American are almost unbelievable. But it’s not the only impossibly true story from that era. The second World War was a time of great turmoil. And while there were many disasters, there were also many events that could be called miracles. The stories of these amazing events live on to this day. In the Internet age, many of these tales have reached a new audience. Technologies such as email, forums, and social media have spread the stories wider. Of course, when people share an amazing story, there’s a tendency to embellish it a little. As the story is passed around, each layer of embellishment accumulates. Eventually, they can soon bury the truth. Instead of an amazing true story, you end up with an impossible tall tale. And yet, almost always, there’s a great true story at the heart of it. Without living witnesses, it can be hard to dig the truth from the exaggerations. Sometimes, it’s possible to find a reliable account from someone who was there. In the case of the All American, we have an interview with one of her crewmen. The interview dates from 2012, and the crewman was one Ralph Burbridge. Ralph was a bombardier, and he lived through every moment of the event. It wasn’t the only close scrape the All American lived through, and it wasn’t even the worse. But it was the most unbelievable. Like all good war stories, the tale of the B-17 All American and its close shave has spread from person to person. And it’s picked up more than a few embellishments over the years. The exaggerations have become more and more outrageous. In the end, the story has been twisted out of shape. In 2012, an email made the rounds amongst aviation history buffs. It contained the most altered version of the story yet. By this point, the story was so twisted that it wasn’t just unlikely, it was impossible. While it was entertaining, it was also full of impossibilities. The result was that many readers wrote off the entire event as fiction. In the email version, the bomber was based in England. In reality, the actual base was Biskra, Algeria (which is only 300 miles away from Tunis). Flying between England and Tunis would exceed the maximum range of the B-17. And that’s not all – it would mean flying over most of occupied Europe to reach the target. A bomber in full working order couldn’t make the flight. There’s no way one that was falling apart could make it. Especially when you consider the exaggerated nature of the damage reported in the email. In the email version, the All American was virtually ripped in half by the collision. The email described the crew tearing parachutes apart for materials to fix the bomber. They even used pieces from the wrecked German fighter! The tall tale also had the gallant gunners dangling from the gutted fuselage to aim their guns. And that’s not all – they had to fire in short bursts because the recoil was pushing the bomber off course. The events described in the email made for an exciting read. But they were also wildly inaccurate. In reality, the B-17 All American’s true story is amazing enough. So let’s remember the events as they actually occurred. 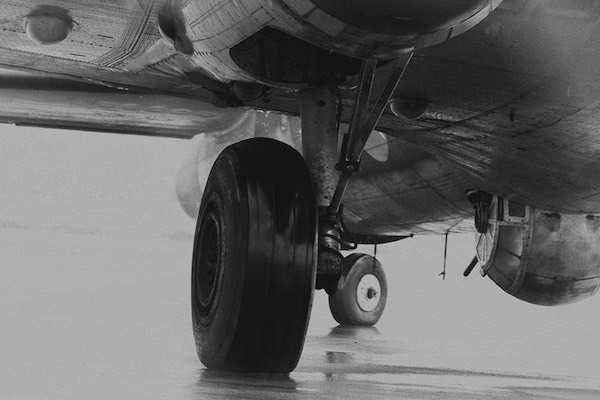 After all, the true story serves to demonstrate the courage of the airmen and the extreme engineering behind the B-17. Thanks for your perspective. My grandfather is Ralph Burbridge. He passed away in 2013, at the age of 92. In fact, he was the final living crewman aboard that All-American. As time and energy allowed during his final 3 years, Ralph attempted to clarify the details of the above-incident. Truth was a foundation of Ralph’s life, so he felt compelled to dispell the unnecessary exaggerations that you referenced.